Offering ambitious sewers and quilters an amazing range of functions, the BERNINA 350 SE will thrill you with its many innovative features. The ease of handling makes working with it a genuine pleasure, and allows even beginning sewers to produce precise, high-quality sewing projects. One of its cleverest features is the BERNINA Free Hand System (FHS), which ensures greater efficiency when sewing. Thanks to the FHS knee lever, you can leave your hands on your project while you raise the presser foot and lower the feed-dog. This outstanding functionality is a genuine technical highlight allowing you more control over your fabric, especially when turning your project: your hands remain free to guide the fabric accurately and reliably, thereby preventing accidental slipping of the fabric when the presser foot is raised. One of the most compelling arguments in favor of the BERNINA 350 SE is its extensive stitch library: 191 pre-programmed stitches, making this machine a versatile precision tool. The direct-selection function and modern, bright LCD display allow you to switch between different stitch patterns in a matter of seconds. With 18 utility stitches, two buttonhole stitches, a full 63 decorative stitches, and 11 quilting stitches, the BERNINA 350 SE is an outstanding choice for everyday mending jobs and alterations, as well as creative sewing and quilting. The simple, intuitive handling, first-class functionality, and solid construction ensure that you will continue to enjoy working with this machine for a long time to come – even when you make the transition from simple to more demanding projects. Sew buttonholes with precise accuracy! With the BERNINA 350 SE Cotton+Steel’s automatic buttonhole function, it could hardly be simpler: the preset buttonhole length is stored in the internal memory, letting you sew buttonholes of the exact same length as often as you wish. Here the machine solves a difficult problem, since sewing identical buttonholes can be a bit tricky. With the BERNINA 350 SE, buttonholes of different lengths are things of the past: the automatic buttonhole function gives you perfect results in no time flat. You are given a choice of two permanently programmed buttonhole styles to ensure that even beginners simply and nearly effortlessly achieve optimal results that will stand up to the most critical scrutiny. The BERNINA 350 SE Cotton+Steel makes room for your personal creativity: its memory offers space for the permanent storage of up to 30 stitch pattern combinations. This means you needn’t reprogram your personal stitch pattern combinations each time – the long-term memory ensures that they’re immediately available the next time you turn on your machine. The direct-selection keys let you access the saved stitches in no time flat – this saves time and increases your enjoyment, allowing you to reuse your own personal favorite combinations or most frequently used stitches effortlessly and whenever you feel like it. This memory functionality offers a premium touch that is by no means a given in entry-level models – Swiss quality, designed with attention to detail. The BERNINA 350 SE Cotton+Steel counts among its features a free-arm extension table enabling you to increase your work area quickly, affording you greater ease when sewing, and allowing for optimum control in guiding your project. Together with the bright LED sewing light, this provides you with the perfect view of your project. 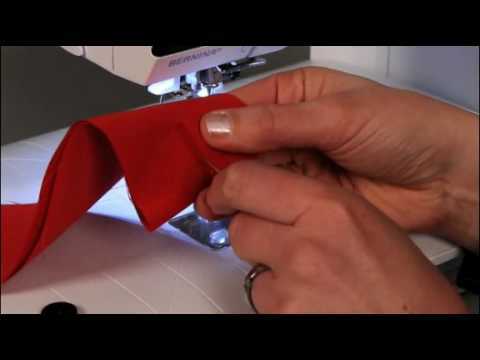 Large-format projects in particular can be handled effortlessly – and once you are done, remove the extension table with the push of a button to return to freearm sewing.